WELCOME! to Reef to Rainforest — the online home of CORAL, The Reef & Marine Aquarium Magazine, where readers come for daily news, happenings and contacts. 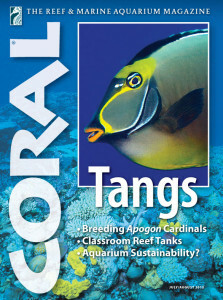 Stay inspired and connected to the marine aquarium world as a CORAL Magazine Subscriber. CORAL Magazine — Six big bimonthly issues per year. Click to enlarge. Thought-Provoking News, Portraits, Interviews, New Gear & Technology, and much more. Published bimonthly with Free Shipping to your home or office. Your Print Subscription includes both sumptuous Print and take-anywhere Digital Editions. A convenient and personal subscription can save you up to 23% off the price of single copies. MORE DETAILS: Your Satisfaction ALWAYS Guaranteed by our award-winning publishing team, serving demanding readers since 1976.